What is the most efficient method of getting your car unstuck from snow? If your car is stuck in snow and you don't have any chains, what can be done to get it out? This can be an unnerving problem to have and it happens pretty easily with normal driving on ice. You wind up in a snowbank sliding into it at 10 mph or any number of scenarios. What are some tools I can carry with me to help me get out of snow? What are some methods I can employ to make it easier to get unstuck in snow? Are there some things I can do before it snows that make it easier to get out of snow? tl;dr: You can use a spade or similar tool in order to dig the snow out of the way. Having said that, there are several things that you can do or might want to consider if you are stuck in snow. Check the Exhaust - Clear any snow that is covering the exhaust so as to prevent the build up of deadly gases within the interior of the car as the engine is running. They are only dangerous to people if the density of the exhaust fumes are able to rise in a confined space such as the inside of your car. Break the Ice - You can use a screwdriver, penknife, multitool or any other sharp object to be able to break the ice directly in front of the tires. The rougher surface will actually help to increase traction as you start to pull away. Remove Excess Snow - I don't know the severity of the snowfall in your geographical area, but if it is very bad you should try to remove all the snow from near the car that is above the ground clearance of the car. This might be easier said than done if your car is beached on ice, but in most situations this won't be the case. A spade or shovel would be the best thing to use for this if you are able to carry one, but if not then a garden trowel might be a smaller, cheaper and more practical alternative for you - especially if you have a small car. 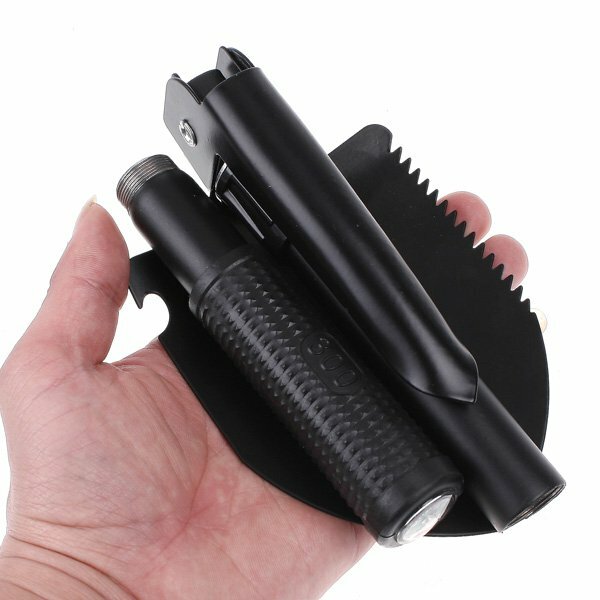 Another good alternative is to use a camping shovel. These are small, inexpensive shovels that serve the same basic purpose as a regular shovel in this scenario (most of them also fold down, making them even easier to stow away discretely in the back of your car somewhere). They can even be tiny, as seen in the picture below (bear in mind that the smaller the shovel, the less practical it will be). Also a good thing to have for moving dirt or soil if necessary. Chains - I know you said you didn't have chains (if you did you probably wouldn't be stuck in the first place! ), but if you did then this would be a good time to put them on to give you some extra traction on the slippery snow or ice. Use a Plank - It can be very useful to be able to stick a thin sheet of metal or a plank of wood underneath each of the drive tires in order to give the car another surface to grip, rather than the broken ice that was mentioned in step 2. Floor Mats or Door Mats - If you don't have any space wood or metal that you can feasibly use (i.e. if you didn't see this post before you got stuck) then you might want to consider taking the car floor mats out of your car and using them under the drive tires instead. Do this only as a last resort as they will probably be destroyed! When doing this, be very cautious with the accelerator. Door mats can also be used, many people already have one, they are much stronger than car floor mats but will probably still get damaged to some degree or possibly destroyed. The woven door mats are cheap, and make practically ideal snow mats in an emergency. Flattened cardboard boxes work just as well, it doesn't matter if they get destroyed and they are free if you've ever bought anything off Amazon or similar. Use the Brakes - Still not going anywhere? This may sound counterintuitive, but if you really think about it, one wheel is normally spinning more than the other because it has less resistance. Pressing the brakes lightly will decrease the speed of rotation of the spinning wheel (by increasing the minimum torque that would be needed to spin each wheel due to the fact that the differential applies equal torque to each of the drive wheels in any car without any fancy traction equipment) and transfer some power to the other wheel so that both wheels are working to pull you out of the snow. Two wheels spinning slowly and working together are much better than if they were trying to work independently in this situation. Note that using the brakes extensively can lead to overheating. If this happens, just turn the engine off for a while and let the vehicle cool down. If you down and your car finds traction, be aware that your stopping distances may significantly increase until they have a chance to cool down again. Check Your Fuel Gauge - It sounds simple but you may get through a lot of fuel (especially if you have a less economical car) while you are trying to get the car out of the snow. If you know in advance that you are going to be driving in heavy snow somewhere on a long journey then you might want to think about bringing a jerry can with some spare fuel with you in case your journey takes longer than expected. Being stuck in snow does not help your MPG! Note that you should not carry fuel regularly due to its fun - and potentially very dangerous - flammable chemistry. Sprinkle Salt - The salt will help to melt ice, which tends to form when you spin the wheels (and that ice is probably the reason you're stuck). Rock salt is preferable, but table salt will also work if you use a lot of it. Sprinkle Other Stuff - Sand, dry soil (not mud! ), cat litter or any other similar materials can all help to provide the car with traction underneath the drive wheels. Spare Fluids - If you have a means of obtaining hot water (melt snow on your overheated car? ), extra windshield wiper fluid or antifreeze (be careful with antifreeze in residential areas, pets like to drink it off the ground and it will poison them, so don't use it where it will accumulate) in your car, that can help melt the snow/ice also. Deicer Spray - Although I disapprove of the idea of releasing these sorts of harmful chemicals in to the environment where feasibly possible, you can - as a last resort - use a chemical deicer spray in order to melt the ice. Straighten the Steering Wheel - Making sure your wheels are straight make it much easier for the car to find traction when it is stuck. Be careful to take not of any obstructions in case your car suddenly find traction. Use a High Gear - Gently accelerate until the wheels start to slip, then reverse, then forwards again until you have created enough room for you to pull out. Using a high gear such as 2nd - or even 3rd if your car will allow you to without stalling - will stop you from spinning the wheels as easily on the slippery surface. 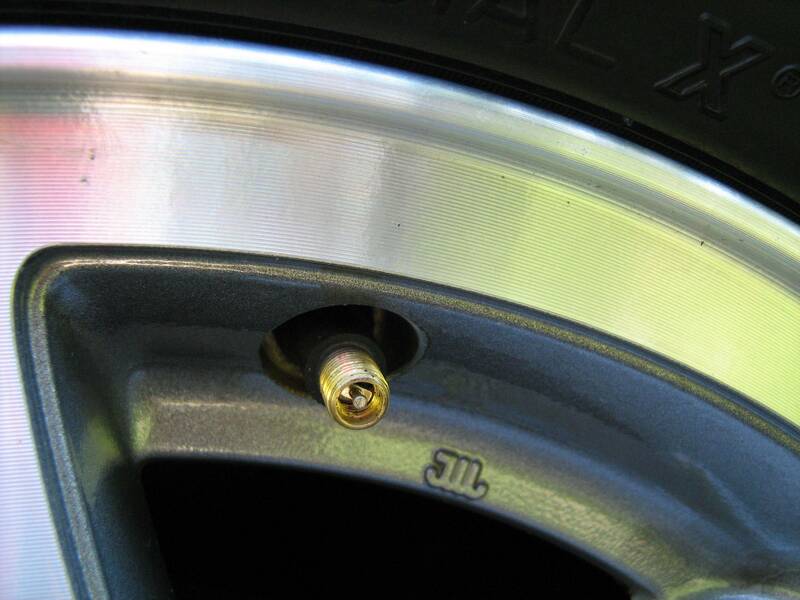 Let the Air Out - Let some air out of your tires from the valve (see picture below) stem using a pin, pen, knife, multitool, car key or similar to increase the surface area of the tire in contact with the ground at any given time, thus increasing traction. You just need something to push in the center of the valve. Use Momentum - You can rock the car using the power of the car, or the collective power of a group of selfless volunteers, or both! This momentum may help to move the vehicle out of the hole that it has inevitably dug itself in to by this point. It should be noted that using the power of the car to create this momentum by shifting quickly between gears should not be a first resort, as the transmission can become overloaded and fail when the momentum is shifted so quickly. Use the Steering (front and four wheel drive vehicles only) - If you have a front-wheel drive vehicle and the wheels are spinning, turning the wheels in a different direction can give you the extra traction that you need. Many people try to get unstuck with a very turned steering wheel as if they want to re-enter the road immediately. This can make it harder, so the idea is to turn the wheel the minimum amount possible (i.e. straighten the front wheels via steering). The front wheels being turned a small amount can resist the limited traction available to the rear wheels in slippery conditions, so straightening out the steering can sometimes help a lot. Remember to accelerate slowly or you will end up just digging yourself in again! Lift and Fill Method - If nothing else has worked thus far, the lift and fill method just might. You should have a jack in your car anyway which is all you will need to be able to do this. Clear the snow, trying to make the ground as flat as possible to make it easier to jack the car up. Put the jack on a firm base such as the plank of wood, sheet of metal or even an old hub cap should do the trick. Jack the most deeply sunk tire up as high as possible. Remember to be cautious as the jack can still easily slip in such slippery conditions. Throw anything you can find (other than snow or ice!) underneath the raised tire in order to increase traction. Use anything like a floor mat, blanket, salt, sand or even your spare tire if there is enough room for it underneath the raised one. Carefully lower the jack on to the pile of stuff. Drive cautiously out of the snow to somewhere where there is traction and don't forget to take away everything you have brought with you so as not to litter. TracGrabbers - They are a product designed specifically for use when a vehicle is stuck and can't find traction. Install one TracGrabber on each drive wheel after you get stuck. Clear any debris as much as possible that is making it harder for the vehicle to move such as snow, large chunks of ice or rocks from in front of the drive tire. Use just enough power for the TracGrabbers to be able to lift and pull the car out of wherever it got stuck. Drive slowly to stable terrain and take them off before you carry on your journey - they are not designed to be used for long distances. GoTreads - GoTreads are another commercial product you might want to consider if you live somewhere with very long, snowy winters. Work with Gravity - Many people when they are stuck in snow will try to make the vehicle progress in the direction they want to travel. If you are stuck on an incline however, you shouldn't try to fight gravity! Try to apply power to the wheels using the reverse gear if at all possible so that you are able to use gravity to your advantage, rather than fighting it. Notice here that the weight of your vehicle acts as a force vertically downwards due to gravity. The steeper the inclination, the greater the value of the force acting against you. In other words, the steeper the incline, the more effort you will have to put in to moving the vehicle up the slope. By moving down the slope in the opposite direction, you will have the same force acting with you. Gloves - Snowy environments are likely going to very cold, as such I would assume that you have already brought gloves with you when you remembered your hat, scarf, coat and hot chocolate in a flask. It is however a good idea to remember a cheap pair of thick gloves that will keep your hands warm and dry whilst you are shoveling snow in the cold. I say cheap so that if you also intend to use them for maintenance they will still allow you to avoid the yukky car goop but not break the bank if they get torn or generally ruined. You can't do anything productive if your fingers are frozen! Propane Torch - This is a fun, effective way to melt some of that rock hard ice if you had trouble using another tool due to high compressive strength. Just try not to melt a hole in your tire! You'd be surprised how easy this is to do. It is also handy for heating that hot beverage I eluded to earlier (as long as you're careful). Go Easy on the Throttle - It's a natural reaction to give the car a lot of power when you're stuck, but more often than not this decreases friction and does a worse job than using just enough to keep surface contact between tire and snow and creep out of the rut. Note that this only applies to getting out of the initial rut. If you have managed to reverse your car out of the rut, you will need to make sure you do use sufficient power to carry enough momentum to be able to drive through the place where you were originally stuck. Disable the Traction Control - By doing this, you are disabling the cars ability to restrict power to the wheels when they start to spin - thus not restricting the cars ability to gain any forward momentum should it find traction on one or more of the drive wheels. As a general rule of thumb; turn the traction control off and then allow the drive system (AWD/FWD/RWD) to handle the power distribution around the car on its own. Note that if you do disable traction control, you should watch your speedometer carefully as you may find it easy to accidentally increase wheel speed more than necessary to the point where if the car suddenly finds traction you could lose control of the car again or even cause a collision! Not to mention there probably won't be much left of your tires after that. Here and here are a few brilliant examples (though there are many others) of how Subaru cars can make progress through snow using their remarkable AWD system without traction control. Especially for Subaru cars, this can be a very effective method to use (even if the snow is really deep). Car key - you aren't going very far without this! Yes. If you do not have some or all of the things on the list above you might want to use your best judgement in order to be prepared for any situation without making your car more cluttered than your average garden shed! For many countries, snow is a rare occurrence anyway so I wouldn't suggest having all of the stuff in your car all of the time. 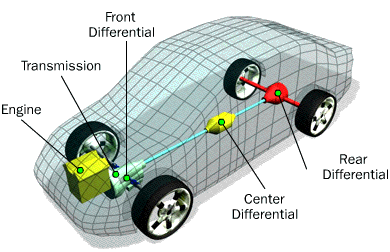 Know Your Car - Do you know where your drive wheels are? If you open your bonnet and see that your engine is mounted parallel to the front axle, you probably have a front wheel drive car. If it is mounted perpendicular, it is probably rear wheel drive. Note that some cars, such as most pickup trucks, SUVs and cars advertised as "quattro" are actually four (or all) wheel drive. This means that all your wheels are able to help pull the car out of the snow. Take your car for a short drive on the motorway - If you notice any wobble or unusual vibration then there is probably snow packed into your wheels which can cause an imbalance. To fix this, pull over when it is safe and convenient and knock the snow out of the wheels by hand (with your gloves on). Be Prepared - A motto from the scouts that certainly holds true here. Keep some of the things listed above in the boot of the car in winter months. One or more of these items can help significantly reduce the amount of time and effort needed to free a stuck car from snow and ice. Some snacks would be a wise addition to such supplies for the times that require a prolonged waiting period of time for help to arrive (not just in snow, but for breakdowns as well). 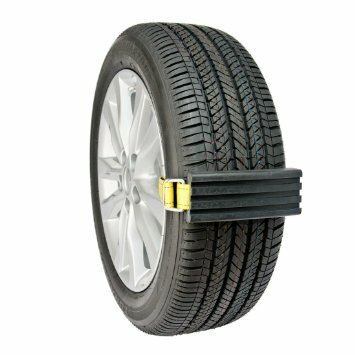 Winter Tires - If you drive in an area that experiences really severe winter (as opposed to the occasional snowfall like you get once a year in England if your lucky! ), consider installing snow or winter tires for the winter months. All-season tires are not nearly as effective in handling snow, mud or similar such surfaces. Be Resourceful - If you haven't got a plank of wood or sheet of metal to increase traction, go and find some sticks or pebbles nearby to use for the same purpose of increasing traction. When You Break Free - If you're moving forward when you break free, continue to drive at a steady pace, aiming for somewhere with less snow where you can safely stop, or get back on to the road. If you have broken free and are traveling in reverse, continue for a couple meters, then let go of the accelerator, allowing the snow to stop the car. Gently accelerate forward in the same tracks you just made with enough speed to break through the original spot. Don't go too slowly or you'll be back where you started! Radiator Air Flow - If you have snow packed in the front of the grille from a snowbank be sure and clear it out before you drive the car too far. It will cause overheating if the air flow is blocked. Overheating can do terrible things to the engine so this is an important one. I would love to hear any other suggestions that you may have to help everyone avoid the snow! A hand winch and a tow strap. You need something to attach it to (a tow hook on your car and something sturdy in the surrounding area) but it's about 90 percent as good as calling a tow truck. 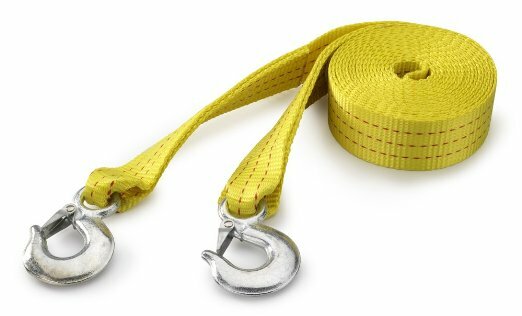 The winch does all the work, the strap just extends its reach to the nearest sturdy object. If pulling the car six feet doesn't unstick it, just put the car back in park, extend the winch, shorten the tow strap and pull it some more. I noticed there was an amazing method not mentioned. 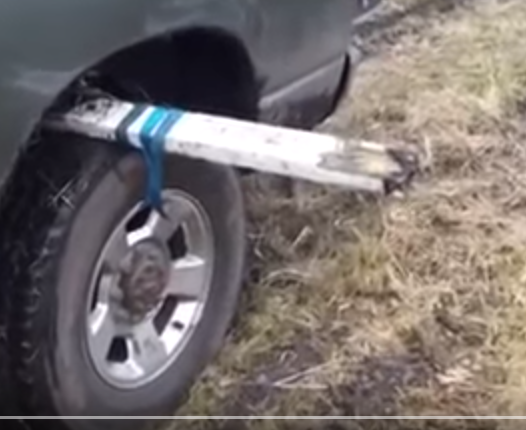 This method gives you that bit of extra traction the one tire needs. Might not work as well on snow, but you can pile packed snow around that tire for extra traction if you can't unstuck the car. Use second gear, or third if possible. This lowers the torque output to the drive wheels and tends to lessen the wheel spin. 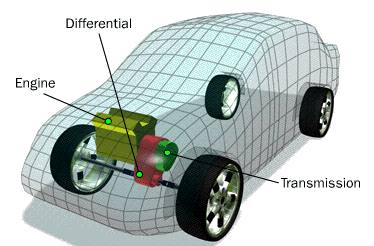 It is not commonly known that the reason 2 is available as a stand-alone gear selection option on most automatic transmission equipped vehicles is this low friction situation. If pulling forward and then removing power (by depressing the clutch) results some movement backwards, this indicates the possibility to "swing" the car. Pull forward with the engine till the point where the car does not move any longer, then allow to roll backwards freely (clutch depressed). When it stops rolling backwards, immediately pull forward again. Each such cycle accumulates more and more kinetic energy until it is sufficient to free the car. I am surprised this hasn't been suggested yet - use simple piece of carpet - easy to pack in the car, Easy to use :) Or, use your floor mats if you have no carpet at the moment. How exactly does an increase in engine temperature cause a car to breakdown? How To Get Organized Without a Garage Workspace?